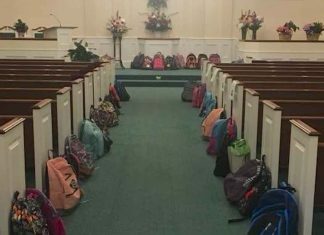 In accordance with one woman’s final wish, there were backpacks lining the pews at her funeral instead of flowers. Tammy Waddell passed away earlier this month at the age of 58 from a prolonged illness at Northside Hospital-Forsyth in Georgia, but before she died, she asked for people to bring backpacks filled with school supplies to her funeral. Waddell worked as a paraprofessional and teacher at several schools in the Forsyth County school district. At one point in her 30-year career, she was even recognized as Teacher of the Year. So when she utilized her funeral as a means of giving back to her students one last time, no one was surprised by the compassionate gesture. Waddell’s cousin, Dr. Brad Johnson, posted a photo of the unique funeral feature to Twitter where it garnered praise and condolences. The backpacks will be donated to Project Connect: a school district initiative that donates school supplies to the region’s neediest students.